The Texas Instruments TI 58 calculator introduced new possibilities in functionality by using a plug-in module with pre-programmed functions. 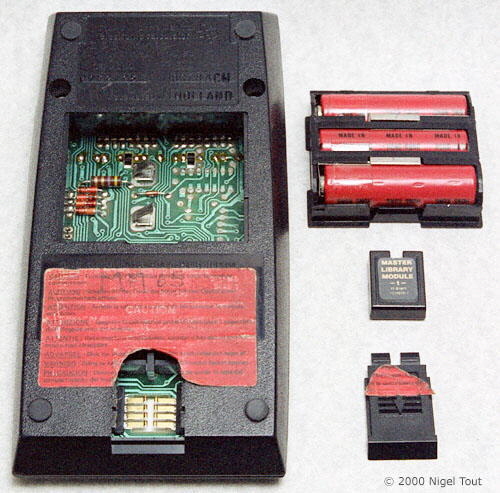 The standard TI 58 model was supplied with the "Master Library Module" plugged into the module socket in the rear, as shown in the photographs below, but it was also possible to buy modules with libraries of functions for other types of calculation. This is analogous to the modern personal computer which is a general-purpose machine in which it is possible to install specialist software to do precisely what you want. So you could buy the general purpose TI 58 calculator and install the program module to give you the specialist functions required. 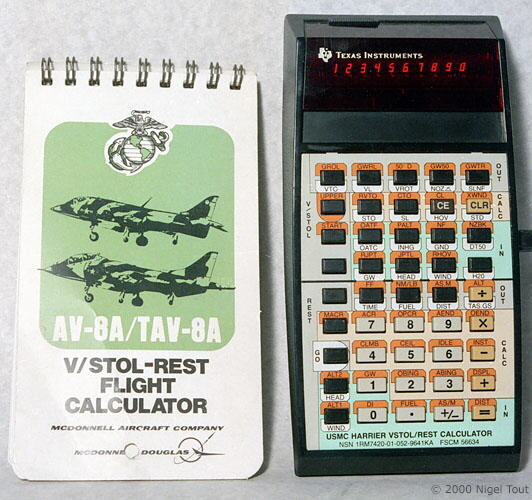 USMC Harrier VSTOL/REST Calculator for the McDonnell-Douglas AV-8A "Harrier" aircraft. The Texas Instruments TI 59 calculator used the same program modules, but also had a magnetic card writer/reader for storing the users own programs, and was also used to a limited extent by other companies as a basis for these specialised models. Texas Instruments TI Programmable 58. Distinctive features: General purpose programmable calculator that can take different plug-in library program modules to provide different functionality. 3.6v (3 x AA rechargeable batteries) . 82 x 150 x 27 mm (3.25" x 5.9" x 1.1"). The "Master Library Module" memory module provides the standard functions of the calculator. 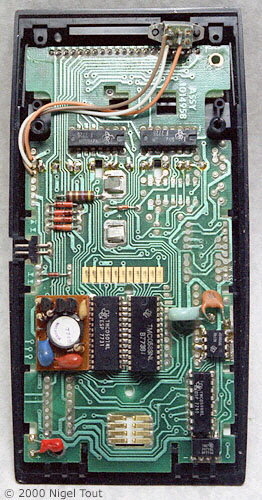 Rear of the TI 58 with battery pack and "Master Library Module" removed. The calculator with the rear cover removed. 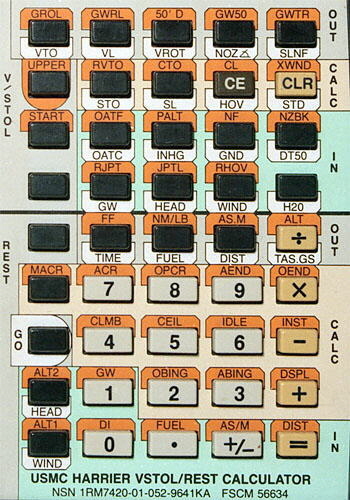 Distinctive features: General purpose programmable calculator fitted with a special program module and keyboard for the USMC AV8-A "Harrier" aircraft. This calculator is fitted with a "Harrier" module to calculate Vertical & Short Take-Off & Land charcatersitics and Range, Endurance, Speed, & Time characteristics of the Harrier aircraft. Originating in Britain as the Harrier the version used by the United States Marine Corps had the code AV8-A (and TAV8-A for the twin seat trainer version). 102 of the AV8-A were delivered between 1971 and 1976, and 8 of the TAV8-A were delivered in 1975 - 1976. The specialised keyboard of the USMC Harrier calculator. 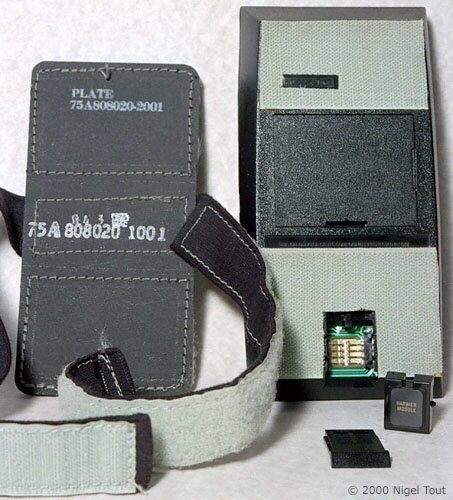 The rear of the calculator showing the program module and the strap attached by a pad with "Velcro". The use of this strap has not been confirmed - the main suggestion is that it appears to be for strapping the calculator to the thigh so it is handy when sitting in the cockpit. Distinctive features: Special version of the TI 58 with module and keyboard designed by the German Allianz financial company for use by its insurance agents. This example "Assembled in Holland". 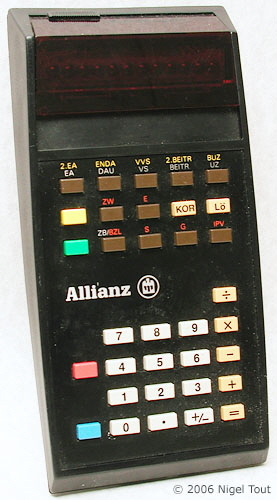 The Allianz program module in place in the socket in the rear of the calculator. 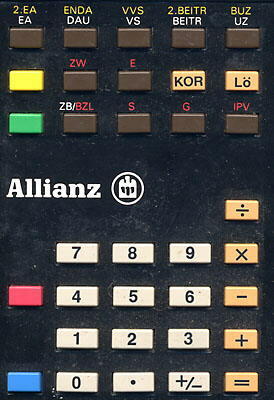 Close-up of the keyboard of the Allianz calculator. The TI Navigatronic is a TI 58 fitted with a Navigation programs module but retains the standard calculator keyboard. For each navigation program a separate legend panel can be slid in at the top of the keyboard to label the special action of each of the upper row function keys. 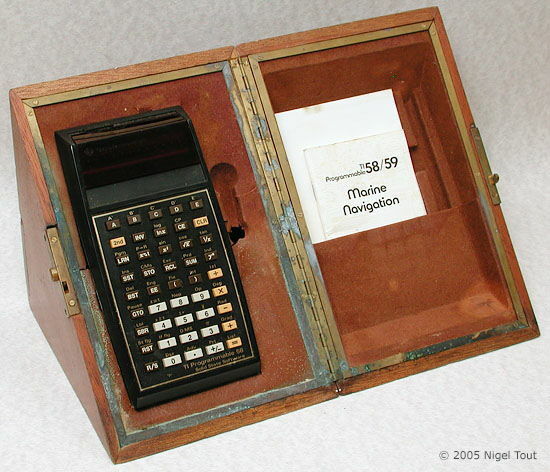 The calculator is supplied in a fitted wooden case. For more details see the Navigation Calculators page.